Zinga's Official Blog informs us that it is coming soon receiving energy everyday. It is a coffee plant for the Base Camp that each harvest gives you 6 Energy. Every 24 hours additionally you can to send a crew request out to your neighbors. If 6 of your neighbors join your crew, you can then receive an additional 12 energy. This is a total boost of 18 free energy per day. 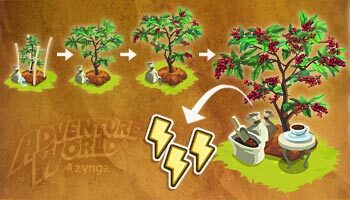 - If you visit your neighbor’s Base Camp and tend their Coffee Plant you will receive coins. - This plant is only harvestable ONLY ONE TIME per day. - You also have the potential to receive a free energy if you already have your own Coffee Plant. - If you have not yet built your Coffee Plant, you have the potential to receive 1 free buildable part for your Plant. I think all of us will enjoy this energy boost for our Base Camp.